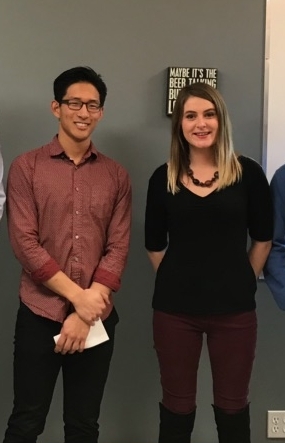 2018 Oldman River Chapter Research in Conservation Scholarship recipients Micky Ahn (University of Lethbridge) and Teagan Holt (Lethbridge College). Teagan Holt from Lethbridge College received $500 for her work on profiling the transportation of aquatic invasives (Zebra and Quagga mussels) in Alberta. Micky Ahn from the University of Lethbridge received $1000 in support of his effort to characterize the complex relationships between parasite load and host biodiversity. Thanks to you both for your important work! A big thanks to all of our presenters. For those who missed out, Jeremy Benson put together a short clip of cutties, bulls, and the occasional whitefish eeking out existence at sub-zero - watch below! We didn't get around to discussing much of our work for 2018, including education and outreach in partnership with the Helen Schuler Nature Centre and in the classroom, work on the Burmis and Hillcrest leases on the Crowsnest river, our angler diary program, and more - stay tuned for further updates. And we hope to see you at our next meeting: May 31, 2018, 6 - 9 PM, Theoretically Brewing.